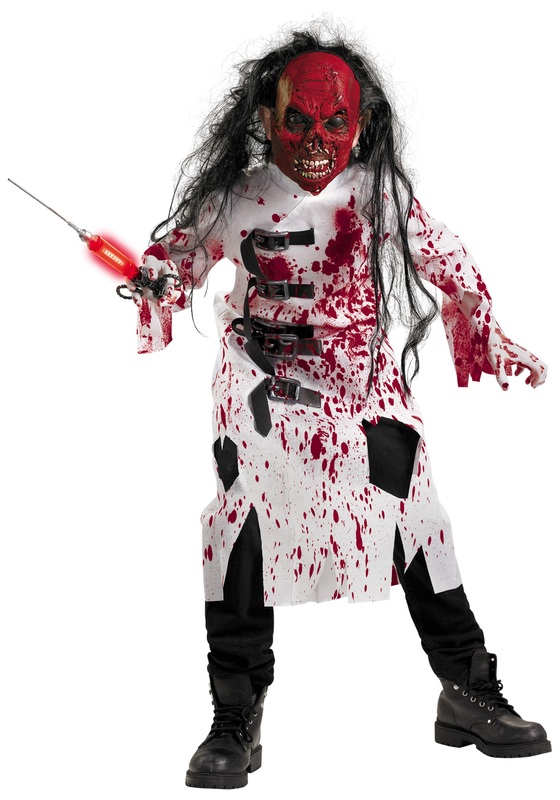 When your child wears this Kids Doctor Dementia Costume he can imagine all sorts of gory experiments! The tattered, blood-spattered white polyester gabardine robe has frayed sleeves and a jagged hemline. It's a pullover that fastens with Velcro™ tabs at center back. It has bloody hand prints on it and five non-functional brown plastic buckles on black faux leather straps down the right front to resemble a straitjacket. The frightening molded vinyl mask has long, stringy black synthetic hair attached. It's red with black eyes, white teeth, and gashes all over it, and it's held in place by an elastic band. There are eye slits for vision and slits in the nose for breathing. Wear it with your own jeans or black pants, and add a toy chainsaw or giant needle syringe!